Today's travel medicine includes not only tourism and business travelers, but also incorporates volunteerism, medical care, migration, ecotourism, and more. 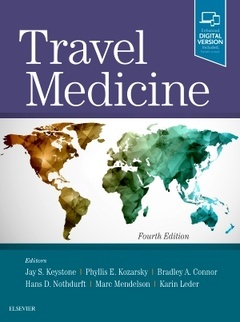 Travel Medicine, 4th Edition, reflects all of these changes in the field while keeping you up to date with new vaccines and newly proposed regimens, pre-travel advice and post-travel screening, and all travel-related illnesses - for a one-stop, authoritative reference on all aspects of travel medicine. 33. Expatriates: Corporate, Missionary and Volunteer.